SIN IS SIN: ALL SINS ARE THE SAME IN GOD’S EYES! ??? The one big thing that many are missing in saying that ‘sin is sin’; and that ‘all sins are alike’ is that if they agree it is sin, then where is the repentance, and confession to God, asking for forgiveness? What sin do we demand absolution from without repentance? For you see, to repent indicates to turn away from the offense. True enough that some have besetting sins, but their desire is to repent and turn away from the sin, not to herald it as OK and demand that everyone accept the sin as normal. When we are saved, this means we Agree with Jesus concerning our need for a savior; we ASK HIM to forgive us our trespasses and cleanse us from ALL unrighteousness; we Believe that He alone provides the cleansing and justification for our sin, and we Confess that He is our Lord! ABC= Ask, Believe, Confess; Simple, yes; but still requiring our agreement with HIM concerning our sin and our need for a savior. Also true, the sins are not what damns a soul; unbelief and refusing God’s provision is what damns a soul to eternal separation from God. For you are indeed correct, that we all sin. No one is justified by works or keeping the law. All need a savior. But as evidence of becoming a new creation in Christ Jesus, we turn away from sins. It is NOT the desire of a child of God to continue in sin. This does not mean as some interpret, that we cannot call sin what it is unless we are sinless. To Judge is to declare another’s eternal destiny. We do this all the time and think nothing of it. To say that another person is going to Heaven or Hell is to make a judgment that is beyond our knowledge. We can believe but God is the judge. He is the eternal, righteous judge; what he declares at the Great White Throne of Judgment will be the final declaration. I say it this way, “God has a gift for you; His gift is eternal Life and this life is in His Son! Receive Jesus, inherit eternal life. Simple, straight forward. Not based on anything we do or don’t do; deserve or don’t deserve. It a gift! Have you opened your gift? Revelation 8:2 begins the Visions of the Seven Trumpets. As the first four seals typify life on Earth during the 2000 year End Time, so the first four Trumpets typify partial judgments that God brings against the Earth during this same period of time. These partial judgments take the form of natural catastrophes that will escalate in frequency and intensity until the very end, i.e. ‘birth pains’. The first four of each of the Seals and Trumpets have to do with the entire End-Time and natural or human events that typify the end time. Both Seal #5 and Trumpet #5 have to do with spiritual consequences for each of these groups. Seal #5 is a view in Heaven with martyrs from the entire ‘last days’. There is no view of Christians on Earth in Seal #5, so we may assume that the Age of Grace has ended; The Bride of Christ has been removed prior to Seal #6 and is not seen again on Earth prior to Christ’s physical return, at which time the Bride will accompany Him. Trumpet #5 deals with partial judgment against those who do not follow the Lamb of God during the same time. These judgments may be natural consequences of ungodly lifestyles, but it is a time of misery, agony and demonic oppression for those who do not have the seal of God in their foreheads. I think we would have to admit that just as Christian martyrdom has typified the whole ‘end time’ so partial judgment against ungodliness also must typify the entire end time. Seal 6 and Trumpet 6 both depict Great Tribulation, and parallel the Bowls of Wrath giving us a different perspective of the same time period. Seal, Trumpet and Bowl #7 all depict the end of the age when God’s Victory is realized. The difference is that the Bowls indicate complete and full judgments (God’s wrath) poured out upon the Earth, so ALL of the first six Bowls of Wrath are emptied during the ‘Great Tribulation’ or Daniel’s 70th week. 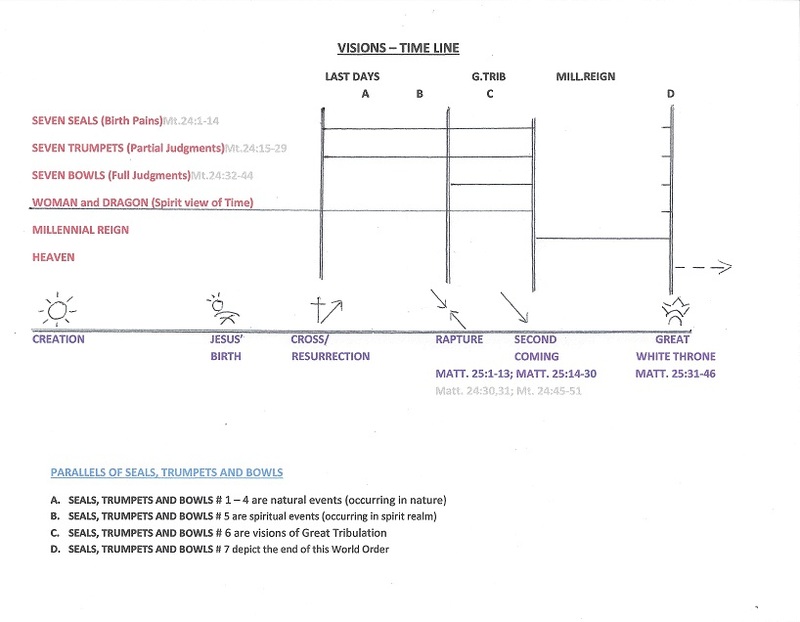 Timeline: Satan was cast out of Heaven with his angels before or shortly after creation. Much of the confusion in understanding Revelation comes because people try their darndest to make it chronological. It is NOT! One way to demonstrate this is to ask ourselves when do certain events occur? If a single event occurs in various chapters then we must overlap the chronology, not make it sequential. One example: When does God wipe away all tears? Isaiah 25:8 prophecies that God will wipe away all tears when His victory is realized. No one suggests that this happens more than once. Everyone agrees that God wipes away all tears after the 1000 years; after the Judgment of the Great White Throne! And yet we find it occurring in Revelation 7:17 before the breaking of the 7th Seal! It says, “And God will wipe away every tear from their eyes.” It says it again in Rev.21:4. Must be the same event! Seal #6 introduces “Great Tribulation”; and Chapter 7 displays those (the elect) who have suffered through Great Tribulation. Rev.7:14 says, “These are they who have come out of Great Tribulation” (Jew and Gentile) Note: The martyred ‘saints’ were already under the altar in Seal #5 prior to the outbreak of Great Tribulation! Revelation contains a series of seven eschatalogical visions. Each must stand alone. They do not run consecutively. The Seven Seals begin with the Cross/Resurrection Event and concludes after this order ceases. The parallels between Jesus’ Olivet Discourse and The Seven Seals of Revelations are striking. Shouldn’t be, I guess, since Jesus is the author of both, but it does lead to a unique way of interpreting the Seals and Trumpets that I believe makes Revelation understandable. Jesus responded that the time would come when not one stone would be left upon another. He doesn’t proceed immediately to answer the questions, but begins with an overview of time from then until the end of the age. Notice he says, “it will be like this… a lot has to happen… but the end is not yet. (vs. 4-6) He’s generalizing the whole period of time. Also notice, it’s not ‘the end of the world’, it is correctly translated ‘the end of the age’. This, according to scripture, is a ‘world without end’. There will in fact be a new Heaven and a new Earth one day, by and by, but that will follow a ‘thousand year’ reign of Christ upon this terra firma. Note: This description parallels the Four Horsemen of the Apocalypse, in Revelation Chapter 6. From the parallels between these words of Christ and the breaking of the seals in Revelation 6, some have concluded that since Jesus is here, obviously describing the whole period of time until the end of the age, then He is doing the same thing in Revelation. The Four Horsemen of the Apocalypse is not a series of events yet to come during a 7 year period of time called the Great Tribulation, but is in fact a synopsis of what life will be like on Earth for the followers of Christ during time until the end of the age. I say for ‘the followers of Christ’ for here in Matt 24 and 25 He is speaking to His Disciples and telling them (and us) what signs to expect. Age of Grace – this is the time from Jesus’ Crucifixion / Resurrection until His Second Coming. This is ‘Grace’ or ‘Salvation’ extended to the nations, i.e. Gentiles. The Parenthesis – this is the time between the 69th and 70th week of Jewish history as recorded in Daniel 9. Begins with crucifixion of Messiah and ends with Rapture of the Church. Age of the Gentiles – this begins with the destruction of Jerusalem and the Temple (this occurred in AD 70) and ends with the Jewish people retaking Jerusalem. (this occurred in 1967) In Luke 21:20 ff, we see Jerusalem surrounded by armies. Many assume this to be future and will take place during the final seven years; however, as verse 24 indicates, this has already happened. It says the inhabitants of Jerusalem (the Jews) “will be taken as prisoners to all the nations.” No one teaches that the dispersion of the Jewish people is yet to happen. That began in AD 70 when the Roman General Titus besieged Jerusalem. It was also then that the temple was destroyed with literally not one stone remaining upon another. That is Luke 21:24a. Part b says that “Jerusalem will be trampled by the gentiles until the time of the Gentiles are fulfilled.” Israel retook Jerusalem in the 6 day war in 1967 fulfilling that prophecy. Church Age – almost synonymous with Age of Grace, this begins with the pouring out of the Holy Spirit on the Day of Pentecost and concludes with the ‘catching up’ of the Bride of Christ, commonly called ‘the rapture’. Last Days – We hear a lot about ‘the last days’ and people tend to get alarmed when a teacher says we are living in the last days; however, scripturally “the last days’ is the entire period of time from the pouring out of the Holy Spirit on the Day of Pentecost until the Bride of Christ is raptured and the Holy Spirit’s indwelling of every believer ends. Acts 2:14-17; (16,17a) “This is what was spoken by the prophet Joel: ‘In the last days, God says, I will pour out my Spirit on all people…” also see Joel 2:28-32. Peter said, ‘This is it!’ Happening before your eyes! Some have objected to the above statement saying that Jesus promised ‘never to leave us nor forsake us’. That is Hebrews 13:5 where God promises never to leave us nor forsake us. Jesus actually says, “And surely I am with you always, to the very end of the age.” (Matt. 28:20b) This is the ‘end of the age’ that we are talking about! So, i.m.o., there will come a time when the indwelling Holy Spirit will cease indwelling all believers as He now does and will revert to an Old Testament type relationship. Also, my opinion, this bespeaks the rapture; for when the Holy Spirit leaves the scene, i.e. indwelling each and every believer, then the believers who have prepared for and are ready for this event will exit with Him. Luke 21:36 says, “Be always on the watch, and pray that you may be able to escape all that is about to happen, and that you may be able to stand before the Son of Man.” As I have written in other places, ‘to stand before the Son of Man’ has two possible meanings. One has to do with judgment and the other has to do with a wedding. I personally do not think this refers to the Judgment Seat of Christ which comes after His return to Earth to rule and reign; rather I believe this reference is the second meaning and is a picture of the Bride of Christ presenting herself to the Groom. It’s a picture of the Bride of Christ being escorted from this abode to stand before the Bridegroom and she is in fact presented to the Groom for marriage. If you’ve followed in Matthew 24, you realized that I left out verse 8. “All these are the beginning of birth pains.” This continues the progression suggesting that Jesus is giving us an overview of the entire age. Earlier He says, paraphrasing, “it will be like this… a lot has to happen… but the end is not yet. (vs. 4-6) Then in verse 8 He compares the whole period of time to birth pains. What’s the significance? He is saying these are signs that typify the age to come, but as we get closer to the end, the signs grow in intensity and frequency right up until the big event. As a mothers’ birth pains grow in frequency and intensity until delivery so Jesus is teaching that all these signs typify the age in which we live and YET, they grow in intensity and frequency until DELIVERY! “At that time many will turn away from and will betray and hate each other, and many false prophets will appear and deceive many people. Because of the increase of wickedness, the love of most will grow cold, but he who stands firm to the end will be saved. And this gospel of the kingdom will be preached in the whole world as a testimony to all nations, and then the end will come.